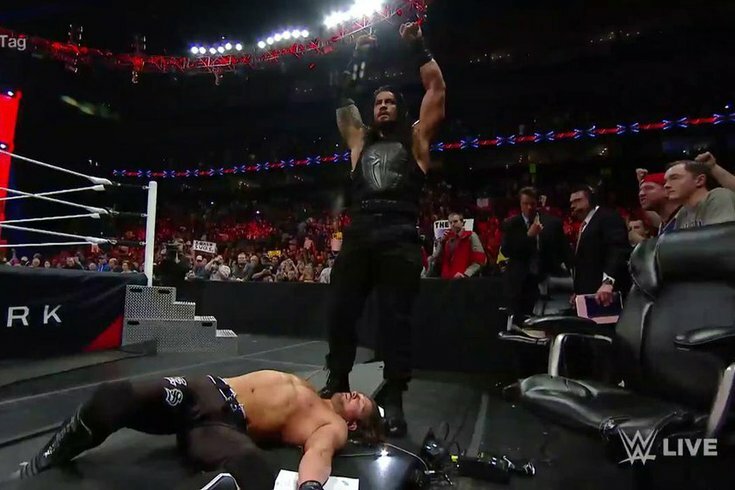 Roman Reigns stands tall after sending AJ Styles through an announce table at the end of Raw. On the heels of a fantastic Payback pay-per-view, WWE brought Raw to the Scottrade Center in St. Louis on Monday night. There were quite a few questions after Payback ended on Sunday night, but we got a lot of answers on Raw. We have a new No. 1 contender for the United States Championship, as I guess Ryback has moved on, maybe for good. We almost had a No. 1 contender for the Intercontinental Championship, but those plans got derailed thanks to The Miz. I’m thinking maybe a Fatal Four Way at Extreme Rules. Who are the combatants? Stay tuned to find out. Who’s the No. 1 contender for the Intercontinental Championship? Stephanie McMahon opened the show and it seemed like business as usual for her until her brother, Shane, interrupted with that awesome theme music and made his way down to the ring. Stephanie had a bag and it contained a peace offering for Shane, which was a picture frame of an old photo with him as a baby and his father. It was the same picture frame and photo their father had stepped on before WrestleMania. Full circle! The two take turns wanting each other to begin listing their ideas for Monday’s Raw, as the crowd, of course, wanted nothing to do with Stephanie’s ideas and everything to do with Shane’s. Before Shane could elaborate on his plans, Kevin Owens’ music hit and he came down to the ring and demanded a rematch for the WWE Intercontinental Championship – one he’s been waiting for since he lost the title at WrestleMania in a Ladder Match. Before the new power duo could answer Owens, Cesaro’s music hit and he was the next one to come down and join the party. Cesaro was mad about Owens interfering in his match at Payback, causing Miz to roll him up and clutch the tights for the win. He never mentioned Sami Zayn, though, who started the brawl at ringside with Owens during the match. The No. 1-contender’s match was on and the winner of Cesaro and Owens would face The Miz at a later date for the Intercontinental Title. Miz joined commentary, along with his lovely wife, Maryse, during the commercial break. The match, however, wouldn’t have a clean ending as The Miz attacked Cesaro in the ring after Cesaro hit him with an uppercut on the outside. After a brief disagreement, Owens and Miz teamed up on Cesaro before Zayn made the save. After all four superstars fought each other, the segment ended with Zayn standing tall in the ring with the Intercontinental Championship raised high. Roman Reigns infiltrated the locker room of AJ Styles early in the night, who was with Luke Gallows and Karl Anderson. They were none too happy about it. Reigns said Styles couldn’t beat him without the help of his friends, and Styles responded by saying he was going to take Reigns’ championship at Extreme Rules, where the two will headline their second straight pay-per-view. Smartly, Reigns responded with backup as he said Styles, Gallows and Anderson couldn’t beat him or his cousins, The Usos, in the ring. The main event stage was set – a six-man tag team warfare. What a great storyline this has been so far. In the main event, Styles got the win for his team after hitting Jimmy Uso with the Phenomenal Forearm. After the match, Gallows and Anderson attacked Reigns and gave Styles a steel chair to finish him off. Styles didn’t look like he wanted to and eventually dropped the chair. One of the Usos picked it up and hit him from behind and then Gallows and Anderson started brawling with them. Styles grabbed the chair and took The Usos out, which Reigns saw and then promptly snapped. He hit Styles with a Superman Punch and then powerbombed him through the announce table to end the show. Reigns is getting edgier and edgier and I like it. WWE has to realize a 1980s babyface superhero doesn’t work in 2016. It seems like it's heading in the right direction right now. Did Natalya give up at Payback? Charlotte, who had just partaken in the Chicago Screwjob at Payback when referee, Charles Robinson, called for the bell when the Women’s Champion had Natalya in the Sharpshooter despite Natalya never submitting. With Bret Hart in his niece’s corner, he had to once again watch an ending of a wrestling match end in a screwjob. Fun. Original. The champion brought out Robinson, aka Lil’ Naitch, and questioned him about Natalya giving up in the match at Payback. A hilarious Freudian slip by Robinson admitted that he let his relationship with the Flairs cloud his judgment. Unfortunately, Yahoo! Sports’ Charles Robinson received a lot of hate because of this. To @wwe fans, I'm not @WWERobinson. I have not sold out the Flairs(?). But I'm open to it. How much $ we talking? #AlsoNotMacFromNightCourt. The champion and her father tried to play off that Natalya verbally submitted. Natalya had enough and came to the ring to make sure everyone knew she didn’t give up. Natalya and Charlotte went at it and Natalya got the better of her, and then slapped Ric in his face before slapping the Sharpshooter on him. Charlotte saved her father from the hold, but not before Natalya was sporting his Hall of Fame ring and gold watch that he left in the ring. Stephanie made a rematch for Extreme Rules between Charlotte and Natalya, and this time, it would be a Submission Match. Stephanie banned Ric from ringside, so we should finally see a clean Charlotte win for the first time in what seems like forever. The Ambrose Asylum featured Stephanie after she told Ambrose backstage earlier in the night that he could ask her whateeeeevvvvveeeeerrrrr he wanted during his talk show. Ambrose began by showing a picture of Stephanie getting speared by Reigns at WrestleMania, something she definitely didn’t see coming. He then wondered why the sudden change in character of Stephanie has happened when he knew the real Stephanie. With Shane’s return, Ambrose pushed and pushed and pushed Stephanie, pushing her emotional buttons by bringing up the sacrifices Shane made than she hasn’t. She responded by canceling The Ambrose Asylum, which was just kind of an, “Aw, shucks,” moment for the Lunatic Fringe. Stephanie re-introduced Chris Jericho as the host of The Highlight Reel. However, as he and Ambrose were getting ready to pass each other in the aisle, the bad blood from Payback rolled over to Raw and the two engaged in a brawl that went from outside the ring to inside the ring. Jericho eventually hit Ambrose with The Codebreaker and then smashed his potted plant over his head on the outside of the ring. I’m guessing we’ll be seeing these two in another match at Extreme Rules. Who are the No. 1 contenders for the Tag Team Championships? The New Day talked about the serious injury Enzo Amore suffered at Payback, causing the No. 1 contender’s match for the WWE World Tag Team Championships to be cut short. Luckily, Amore seems to be okay and suffered a concussion, which WWE takes very seriously. The Vaudevillains came out and used Amore’s injury to get some heat for themselves, which is Pro Wrestling 101. Great stuff. They were then interrupted by the Dudleys – yep, they still exist in the WWE Universe – and they wanted a shot at the tag titles despite being eliminated by Enzo and Cass in the tournament a few weeks ago. Colin Cassady, aka Big Cass, came out and made that very point. Cass was very impressive going solo on the mic and then wasted no time attacking Gotch and English, which led to an eight-man tag match. Cass got the win. Fifteen superstars battled for the right to become the No. 1 contender to Kalisto’s United States Championship on Monday night. Kalisto was at ringside on commentary taking it all in and put Ryback in his rear-view mirror after defeating him twice at the last two pay-per-view kickoff preshows. Last Monday, we saw the demise of the League of Nations. On Monday night, the final four of the battle royal consisted of Sheamus, Rusev, Alberto Del Rio and Zack Ryder. The former faction worked together for a little bit before turning on each other, allowing Ryder to eliminate Del Rio and almost eliminated Rusev, but the Bulgarian Brute held off the fan favorite Ryder and eliminated him, becoming Kalisto’s new No. 1 contender. Rusev is a former United States Champion, and I wouldn’t mind seeing him regain the title for another run. •	No. 1 Contender’s Match for Intercontinental Championship: Cesaro d. Kevin Owens by disqualification after The Miz attacked Cesaro. •	Tyler Breeze d. Goldust by pinfall via a rollup. Goldust was distracted by Fandango’s and R-Truth’s dance contest outside of the ring. •	Eight-Man Tag: The New Day/Colin Cassady d. The Vaudevillains/Dudley Boyz by pinfall after Cass hit D-Von Dudley with the East River Crossing. •	Emma d. Becky Lynch by pinfall via a Michinoku Driver. Emma countered Becky’s Dis-arm-her, hit her with a thumb in the eye when the ref was distracted, and hit the Michinoku Driver for the win. •	No. 1 Contender’s Battle Royal for the United States Championship: Rusev eliminated Zack Ryder to win the battle royal and become the No. 1 contender to Kalisto. •	Six-Man Tag: AJ Styles/Luke Gallows/Karl Anderson d. Roman Reigns/The Usos by pinfall after Styles hit Jimmy Uso with the Phenomenal Forearm.